Specifically, the late 1940s, which saw us return as a Club following the Second World War, and the major roles played by two instrumental individuals in Jack Knox-Peden and Albert West who were responsible for establishing the re-constitution of the Spartan Club. 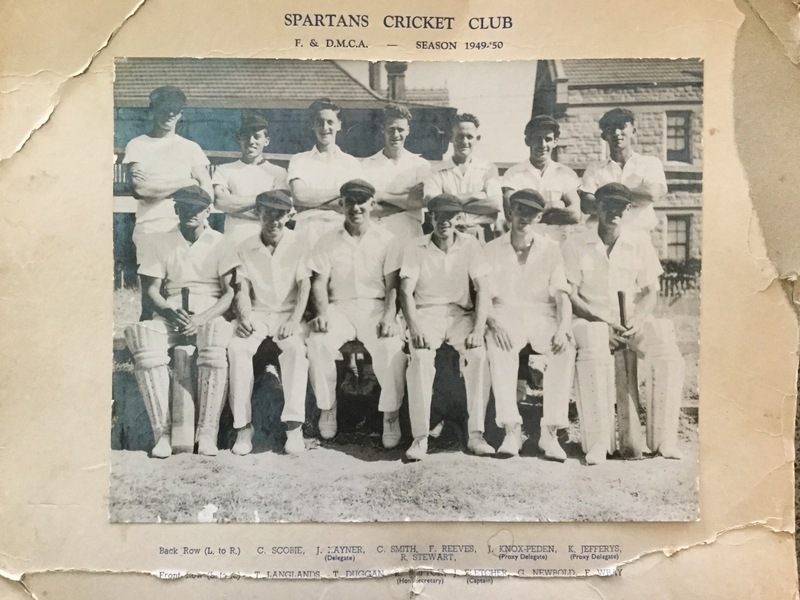 A very special thank you to Spartan Life Member Mervyn Smith who has kindly provided us with a fantastic photo (visible below) from the 1949/50 season, a period in time that has been extremely difficult to piece together, due to a termite infestation which destroyed many of the Club’s records and writings up to that point. Our first President of the post-war era of the Club, Mr. Albert West, was a meticulous record and history collector, hand-writing many events at the Spartans during the course of the 1940s. Unfortunately, when his work was presented in a tin trunk to Secretary Brian Waterer in 1965, it was discovered that termites had destroyed the contents. It is therefore with great appreciation that we thank Merv for supplying us with this sensational photograph from the period, as it represents one of the few pieces of memorabilia remaining during what was such a significant time in our history. The Spartan Cricket Club was reborn thanks to the efforts of two very fine cricket stalwarts in Albert West and Jack Knox-Peden, three years after it was put into remission in early 1942. West, formerly of the Essandee Club, and Knox-Peden of the Navy Club, were responsible for reforming the Spartan Club, reconstituting the association in which we had participated in, the Fremantle & Districts Mercantile Cricket Association (The F&DMCA), and founding something known as the West Australian Cricket Union. Read on below for some excellent insight into this fascinating chapter! View All The Entries In Our “From The Archives” Series! The Spartan Cricket Club pictured in 1949/50 (Thanks to Mervyn Smith). Back Row: C. Scobie, Joe Rayner (Delegate), Charles Smith, Fred Reeves, Jack Knox-Peden (Vice President), Keith Jeffries (Proxy Delegate), R. Stewart. Front Row: Tom Langlands, T. Duggan, Ken Clifton (Secretary), Jim Fletcher (Captain), Geoff Newbold, Fred Wray. The seasons leading up to the one from this photograph had been quite insignificant in terms of our performances on the field, we seemed permanently relegated to a sixth out of ninth position in the four seasons previous, but things turned around in 1949/50, as we made finals for the first time since before the Second World War. Ultimately however, we were defeated in the semi-finals to old rivals East Fremantle, despite the efforts of Keith Jeffries (back row second from the right), who took 7 for 39 in the match including a hat-trick! 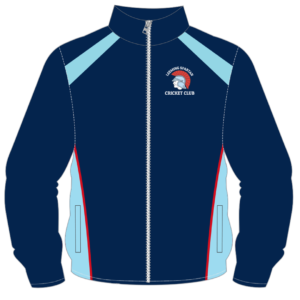 The following season was a disappointing anti-climax to the efforts of this one, as the Spartans slumped to an eighth placing in a nine team competition. The other clubs at this stage were W.W.F. (better known as the Lumpers), Scots, East Fremantle, CBC Old Boys, Hilton Park, Park Cricket Club, South Fremantle, and Wanderers. Off the field, for his phenomenal work in re-establishing the Spartan Cricket Club following the Second World War, President Albert West was formally inducted as the Club’s first Life Member. Previously, the Club’s senior executives had opposed Life Membership, a sentiment that largely stemmed from our time in the Churches Cricket Association, but it was finally introduced this season, and has since become our most prestigious individual award. You can view the full list of Life Members here. The next few seasons continued to be lean ones with the Spartans never really threatening to be a force in the competition until 1957. This 1949/50 photograph of the Spartan Cricket Club really is a priceless and incredible artefact, and on behalf of the Club, an enormous thank you to Merv Smith for bringing it to our attention! It depicts the entire playing group of the Spartan Cricket Club as it was at the time, as we had only the solitary team in the Fremantle & Districts Mercantile Cricket Association, and actually features the man who would succeed Albert West as Club President, Mr. Jack Knox-Peden in the back row. Furthermore, Charles Smith is shown in the back row as being third from the left, and he is actually an uncle of Merv’s. Merv Smith was inducted as a Life Member of the now Leeming Spartan Cricket Club in 1993, some forty-three years after this incredible photograph was taken. Behind the players is believed to be the school buildings of the Christian Brothers College (CBC) in Fremantle, meaning that we can deduce that this photograph was taken on Fremantle Park, which sits opposite the school. Fremantle Park was at the time the main ground for teams within the Fremantle & Districts Mercantile Cricket Association, and although it was never an official home ground of the Spartan Cricket Club, it certainly served as our central hub of activities. 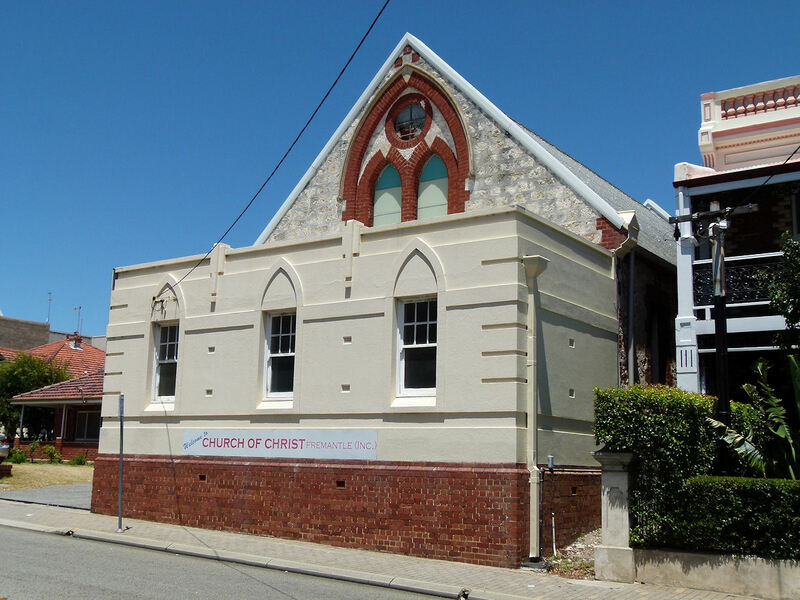 We also used the Church Of Christ on High Street, Fremantle (pictured left as it exists today) as our unofficial ‘clubhouse’, where members would congregate after the games and a number of functions were held over the years. 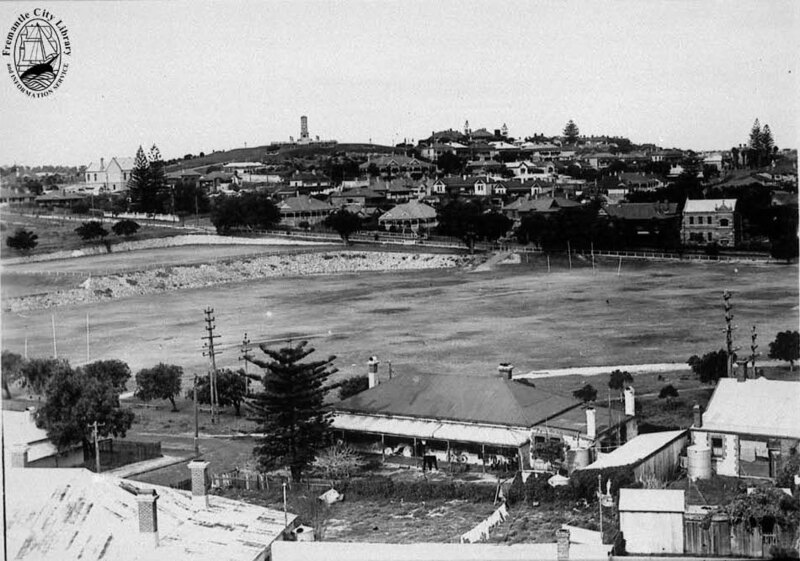 During the Second World War, the surface of Fremantle Park (visible below during the mid-to-late 1940s) was utilised in the war effort, with a a citizens defence bivouac setup on its surface, which provided the added benefit of preventing any enemy aircraft from landing on the flat landscape. Fremantle Park sometime in the late 1940s. At this time, the ground served as the primary playing location for the Spartan Cricket Club, although we also used the Church of Christ Hall in Fremantle as our ‘clubhouse’ of sorts. More Information. As mentioned previously, many of the records and writings of this period have been destroyed due to termites, which had eaten their way through the papers and documents that had been carefully stored inside a tin box by President Albert West. Significantly, much of the history regarding the specifics of the re-establishment of the Spartan Cricket Club in 1945 has been lost, as well as many of our on field performances in the late forties. Albert West (pictured left) presented Brian Waterer, then the Secretary of the Club, with this tin in 1965, which contained records of the association (the F&DMCA, which West was also a highly influential member of), the Essandee Cricket Club, and the early post-war years of the Spartans, but of course it was to no avail as they had been destroyed by termites in the one and a half decades since their creation. West proved to be a much needed powerful figure, and together with Jack Knox-Peden, the two men almost single handedly ensured the Spartan Cricket Club would return stronger than ever. Having essentially been reborn, the Spartan Cricket Club was now into its twenty-seventh season, with all facets of its operations off the field needing to be completely overhauled or re-introduced. It was unfortunate, however in hindsight somewhat expectable, that the Club never really posed a serious threat during the late forties, as its structure and re-establishement would have had to have been the prime focus. Nevertheless, the Club welcomed a series of newcomers ahead of its first season back (which was the 1945/46 season), including Jim Fletcher (who later joined the Scots Cricket Club where he captained, served a term as President, and was awarded a Life Membership), Joe Rayner, a well known servant of the Spartans who played for 21 years before resigning to accept the post of Captain-Coach of the newly formed Medina Cricket Club, and Bob and Keith Jeffries. Ian McClumpha resumed as captain, and in all his reign as leader lasted from 1931 to 1948. He resigned from the Spartans at the end of the 1947/1948 season to accept the position of Captain-Coach of the newly formed Hilton Park Cricket Club. George Prince also returned to lead the attack, where he received considerable assistance from another pre-war player in Tom Langlands, who had been an outstanding all-rounder in Western Australian country cricket, and a new face in that of young demon fast bowler Tolly Chalmers. Click to download a full sized version. 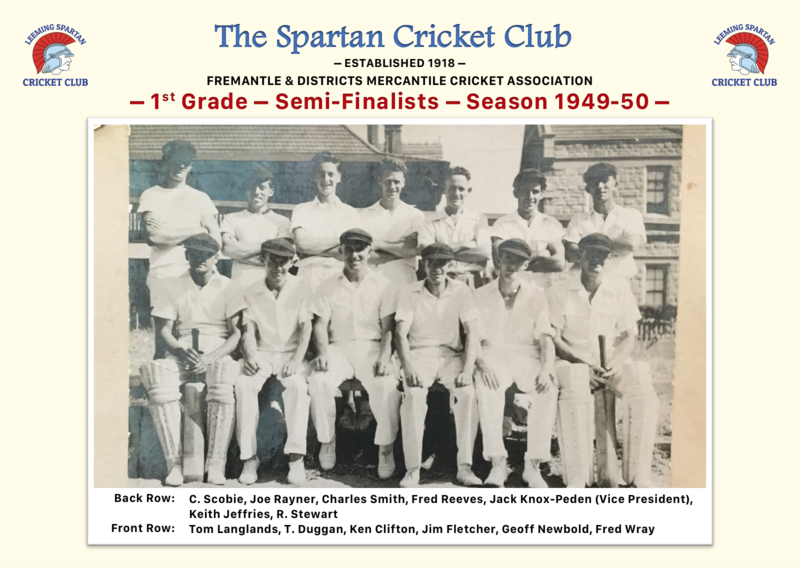 It is difficult to put into words just how significant this period during the 1940s was – it saw the Spartan Cricket Club’s re-emergence following the greatest atrocity in human history, World War Two, and our post-war successes can certainly be credited to the fine efforts of Albert West and Jack Knox-Peden. It remains the most significant single event that the Spartan Cricket Club has ever had to overcome, and the fine efforts of these two individuals are ones that we sincerely hope will never have to be replicated. It is extremely unfortunate that we may never know the full extent of the goings-on during this decade, but we will never forget the overall achievements made during this period. Certainly re-establishing the entire club is without doubt a superhuman task. Additionally, it was sure to have been a fantastic period for all members within the Spartan Cricket Club, with many memories made, and it would have been fascinating to know that when West and Knox-Peden got the Club back up and running in 1945, would they have ever imagined that more than seventy years on, the Club would be as strong as ever! Of course, one final thank you to Spartan Life Member Mervyn Smith for kindly supplying us with this incredible photograph, it is actually one of just four photos that we have on file from this decade. Should anyone have any other photos from the period between 1940 and 1950, please do not hesitate to let me know, we will carefully scan it on to the computer and will get the original back to you quickly as possible! Additionally, you may also wish to immortalise some of the memorabilia you may have at your disposal inside our incredible trophy cabinet at our clubhouse, with special thank you to those who have already donated priceless pieces! This is the fourth instalment in our “From The Spartan Archives” series, which we hope to bring to you at regular intervals during the off season. Should anyone wish to aid with the development of the series, please feel free to Email me!